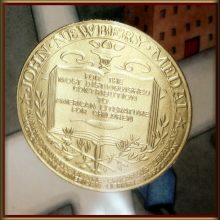 Every January the American Library Association grants awards to a variety of talented authors and illustrators that highlight the year’s many excellent works created for children and youth with their Coretta Scott King Awards, (John) Newbery, and (Randolph) Caldecott Medals. Last week we highlighted past winners, this week we share this year's winners below. If you'd like to place a hold on one of the titles, simply click on the title or book cover. A Big Mooncake for Little Star, illustrated and written by Grace L in, published by Little, Brown and Company, a division of Hachette Book Group, Inc. Thank you, Omu!, illustrated and written by Oge Mora, published by Little, Brown and Compa ny, a division of Hachette Book Group, Inc. The Night Diary, written by Veera Hiranandani and published by Dial Books for Young Readers, Penguin Young Readers Group, an imprint of Penguin Random House LLC.